However much we may get to know about God, even know God in a true personal way, God always remains a mystery. “Mystery” is almost another name for God. But a mystery of love, a mystery of incomprehensible goodness. For God: “Loved the world (us) so much that He gave his only Son” so that we may have eternal life in and through Him. One God, yet not just one person who is God! 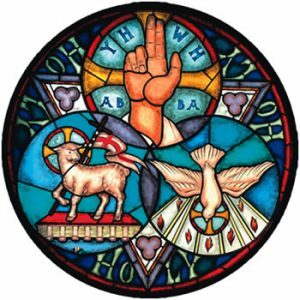 Of course, we cannot understand how the three Divine Persons are the one God, but we know this great truth because in Jesus God has revealed it. Hence we human creatures, loved by God, are loved by each of the Divine Persons. Theirs is a marvellous unity. They are perfectly one in their being and in all the divine “doings”. Such a unity is beyond our understanding. An example, however inadequate, may offer a little light. Many of us have had the experience of being so close to a friend, so deeply fond of another and so much in harmony together that the friend seemed constantly with me – almost like another self within me. Some of the Saints experienced friendships like this. 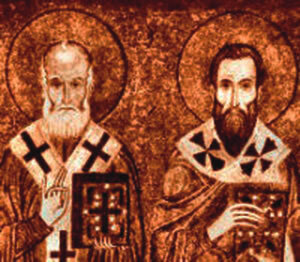 Two great teachers, Bishops of the 4th century were St. Basil and St. Gregory Nazianzen. St Gregory spoke of their great bond. “… we were all in all to each other sharing the same sentiments, the same table, our eyes fixed on the same goal, as our mutual affection grew ever stronger. We seemed to have a single soul animating two bodies… we at least had to believe we were in and with each other”. (Office of Readings for feast of St Basil). In God, each divine person is actually present to and with the others, as each possess the fullness of the one divine nature – a nature of goodness, love, power and mercy. Each one of us has our origin from our parents, and our origin is, of course, an origin of dependence. And each of us has a real relationship with them and they with us. In God, the second person has origin from the first, the Father. But without any dependence. They are really related as Father and Son. The Holy Spirit, the Spirit of love has his origin from the Father and Son together. Again without dependence. We cannot understand how. Each divine person is that very relationship. He is not “someone” who has a relationship. My mother had an important relationship with me, but that did not constitute her very personhood, all that she was as a person. Each divine person, Father, Son and Holy Spirit is entirely “grounded” in such relationship. As long as God has been God (that is, without beginning, eternally,) the divine desire was not only to create and to create us humans, but was that his human creatures would participate in God’s own life, as children of God. God the Father, possessing the fullness of the divine goodness, loves us as Father and draws us to share God’s own life as God’s children. God the Son, possessing that fullness of divine goodness, loves us and seeks others to be one with Him as children of God. God the Holy Spirit, having that same divine goodness, and being personally the Bond of Love seeks to unite us in a communion of love with God in His life. 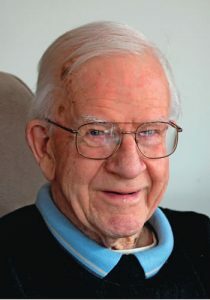 “I am going now to prepare a place for you and when I have prepared a place for you, I shall return to take you with me so that where I am you also may be”, in that communion of life with the Trinity. “My Father and Your Father”! How extraordinary! How come? The Son has made it possible for us humans to become, with Him and through Him, children of God. Let us then whole-heartedly often offer our praise and thanksgiving to the Blessed Three; Glory be to the Father, to the Son to the Holy Spirit. Al-le-lu-ia.